I was determined to do something positive this week and I am grateful that lines were falling to me in pleasant places. One of the most important things that happened was my journal, it became a bestie this week and I wrote in it everyday. I planned and tracked my workout, planned and tracked my food, I wrote down my feelings including reasons for my failures and ways out. A way out came handy this week. As you all know HABITBULL was the app I had been using to track new habits over the past few weeks, but somehow it's either I got bored or the app was too shallow for my liking. 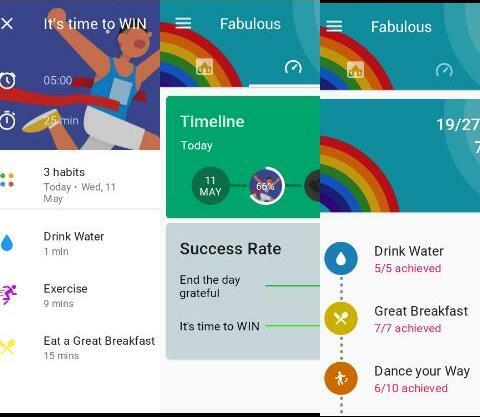 In my research (a friend mentioned it in a post) I found Fabulous: Motivate me, there are lots of motivating features on this app like daily challenges, voiced reminders and articles targeted at developing good habits over time. It also has it's own exercises e.g. a circuit training for 7 minutes to get you awake each morning, 3 minutes core circuit and a 1 minute move your body circuit. When you click on the 'drink water' button, there is a sound of pouring water which always gives me a feeling of going to the bathroom, lol. The apps personalizes you and addresses you by the first name when you are alerted for articles or reminder. Right now, I have not noticed any shortcoming that is unbearable, I will give it a five star rating. I named it "It's time to WIN"
This app has had a positive impact over me despite I am just a week old using it, I now take a glass of water at waking up every morning. I read an article that gave me hints on how to be energized through my day (this I have been battling with for a while) and Fabulous had helped me tremendously. I woke up very early today and I did not need to snooze the alarm, I was up and agile enough to do my daily routine. I followed my eating plan for the previous week and my new workout plans will be posted soon.